The Napoleon Allure 42-inch Electric Fireplace puts out an incredible 5,000 BTUs, heating rooms up to 400 sq. ft. The glittering glass ember bed sparkles from the multicoloured flames that you control with the touch of a button. Traditional orange, or cool blue flames, and a combination of the two will set the mood every time. You don't need a specialist or a gas fitter for installation, just hang on the wall and plug in for an instant transformation. The 5-inch depth means that this fireplace doesn't intrude into your living space, but simply accents it. Place the Allure 42 electric fireplace anywhere you want to make a huge impact; it's ideal for every room in the house. Contemporary with a twist, the Zinc frame of the Vallens wall mount will liven any dicor. At 36 wide its size is small enough to not over power any room but its decorative ember beds and flame effect will demand attention. The three choices of ember beds will fit into any design look. To highlight the ember bed, the ember bed colour can be changed with a choice of 3 colours of Orange, Blue and Purple, plus a slow colour fade between all three. This sophisticated 50 Electric Fireplace can be utilized as a recessed or surface wall mount, optimizing the large viewing area without taking up any valuable floor space. The unit features a 10 color LED flame effect paired with a bed of resin crystals, producing an elegant, chic look. The Mirage is just as functional as it is beautiful with up to 1400 watts, powerful enough to heat 400ft. Enhance the stylishness of any space with this breathtaking electronic fireplace. 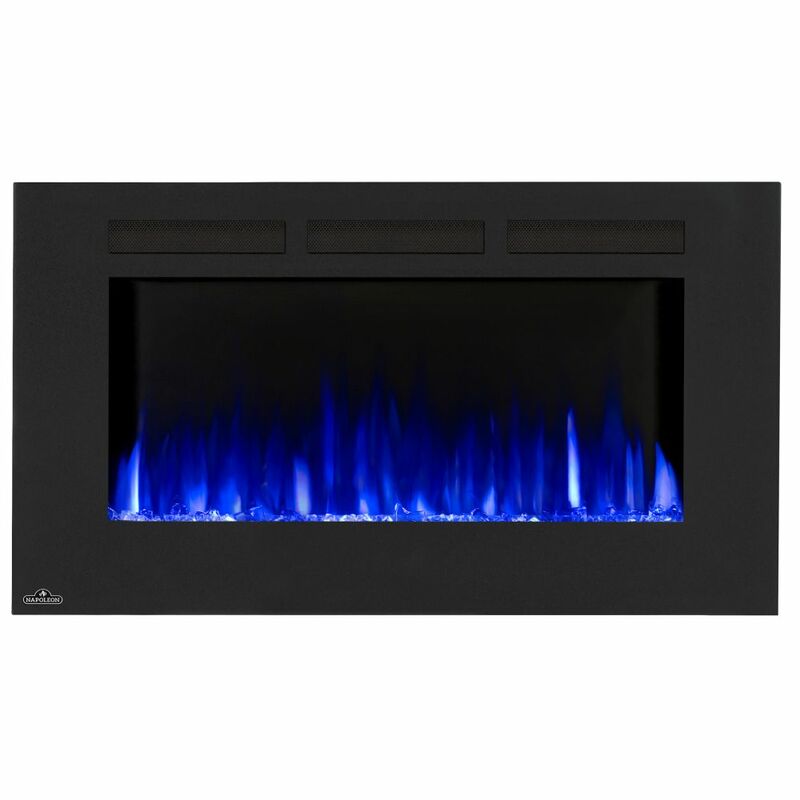 Allure 42-inch Linear Wall Mount Electric Fireplace The Napoleon Allure 42-inch Electric Fireplace puts out an incredible 5,000 BTUs, heating rooms up to 400 sq. ft. The glittering glass ember bed sparkles from the multicoloured flames that you control with the touch of a button. Traditional orange, or cool blue flames, and a combination of the two will set the mood every time. You don't need a specialist or a gas fitter for installation, just hang on the wall and plug in for an instant transformation. The 5-inch depth means that this fireplace doesn't intrude into your living space, but simply accents it. Place the Allure 42 electric fireplace anywhere you want to make a huge impact; it's ideal for every room in the house.